Within the basic configuration, the connection to the SQL server or to the databases is defined. 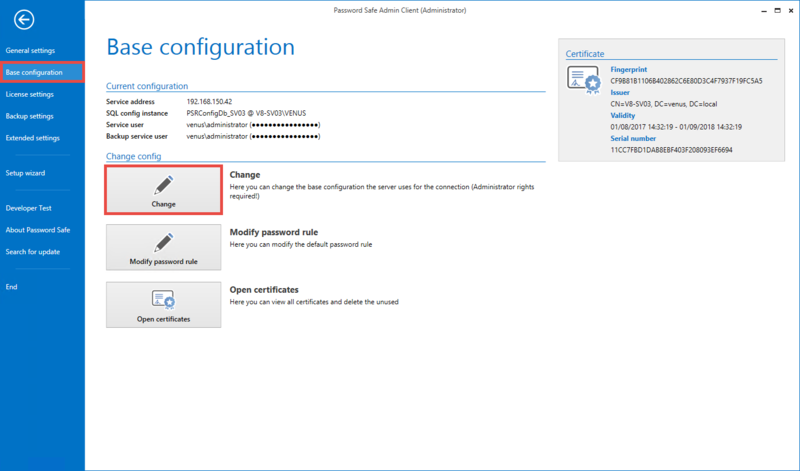 The basic configuration appears the first time the AdminClient is started and can be called up at any time in the basic configuration. The service address of the SQL server can be selected via the drop-down menu. It is mandatory to select the adapter via which the AdminClient can also access the SQL server. *The loopback address 127.0.0.1 should not be used here. This setting is used to define the service user, which is needed to start the server service as well as the backup service. The “Use local system” setting starts the services with the local system account. !The defined service user needs local administrator rights to properly configure the server and create databases. Under “SQL Server instance” the database server must be specified, including the SQL instance. 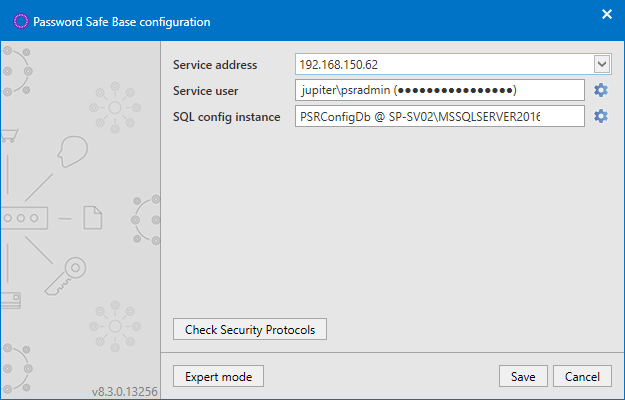 For simplicity, you can copy the server name from the login window of the SQL server. 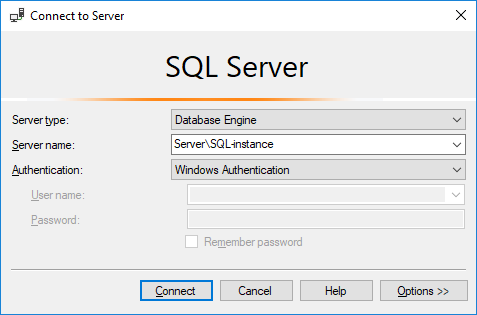 If the option “Service user” is selected, enter the user that logs on to the SQL Server. Please note that “dbCreator” rights are necessary to create a configuration database. “dbOwner” rights are sufficient if the database is created manually on the SQL server and is only accessed here. Enter the name of the configuration database under “Database”. *Refer to the System requirements for server section for more information about the users. You can use a dedicated user to run the backup here. The service user is selected by default. This menu item can be configured in expert mode via a so-called connection string. The SSL connection certificate can also be configured under this item to protect the client server connection. By default, a certificate is generated by the AdminClient. However, you can also choose your own. Further information can be found directly in the section provided for this purpose. !Exchanging or overwriting an existing certificate may cause warnings to the clients if the certificate is not trusted by each client. Host mode is not yet supported in the current version and thus should not be used. *If this option is changed, the server needs to be restarted so that the change can take effect.